All of us know the famous and popular old game, Bounce from Nokia. This game was one of the most attractive games which has ever released. You face some different paths to cross some hopes to finish each level. Sometimes during the game play, you need to highly concentrate on the level. 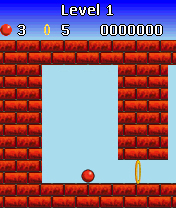 As you may know, The original Bounce game had just 11 levels. The Symbian series got 21 levels, and then, games like Bounce Back, Bounce Tales and 3D Bounce Touch were released. But I’ve also created 5 more levels in continue to the original Bounce levels. You can play these new 5 levels of Bounce by Downloading this JAR file onto your mobile phone and install it. Note: You can activate “No Game Over” cheat by pressing 787898 during playing a level. Also, by pressing 787899 you’ll activate level skipping (press 1 and 3), finishing the level (press 5) and reverse gravity (press #). I’m Currently working on an Android and an iOS version if the Bounce. The new version has more features and a more cool design. I will put it here as soon as I finish it.